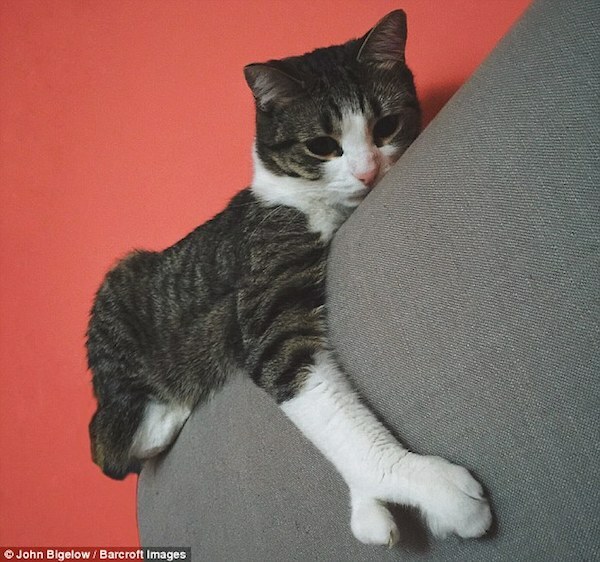 A cat born with a claw-shaped paw has gained a legion of fans online. Two-year-old Lobstah, who lives with his owners in San Francisco, has a deformed paw shaped like the letter 'C'. He was adopted by John and Leda Bigelow from an animal shelter after being found abandoned with a host of health issues. Lobstah had to undergo life-saving surgery and was still in recovery when his new owners took him home. John said: 'There was a likely chance that he was not going to have survived the surgery. Lobstah has no sternum, which caused a problem with his intestines going into his chest. This has now been corrected by vets. Despite a tough start in life, the moggy has managed to live a relatively normal life and has since become an internet star. The friendly feline has racked up more than 15,000 followers on Instagram since his owners created him his own account. It's not only his claw that's unique - his owners say he is 'oddly fond of greens', like spinach and green beans. Leda added: 'He's a little clown, he's a comedian. I think he actually is funny, I don't know if he knows he's funny. He's always up to a little mischief. Flipper the kitten has been given a new lease of life. The black and white cat's last owner had threatened to 'dispose' of him because he was born without a radius and was unable to walk, but he was rescued by the RSPCA. And after months of surgery to fix his legs, Flipper has found a new lease on life after new owners agreed to care for him. Veterinarians found flipper was born without a radius, meaning he needed to have his limbs splintered to help straighten the bones. Flipper was adopted by a pair of Canberra locals set to give him the 'loving and supportive home he deserves', according to a post on the RSPCA Facebook page. The cat is still in the healing process, which entails needing to wear his legs in a cast five days a week until he is fully grown. The story has melted hearts on social media, with many congratulating the RSPCA and Flipper's new owners on saving the animal's life. 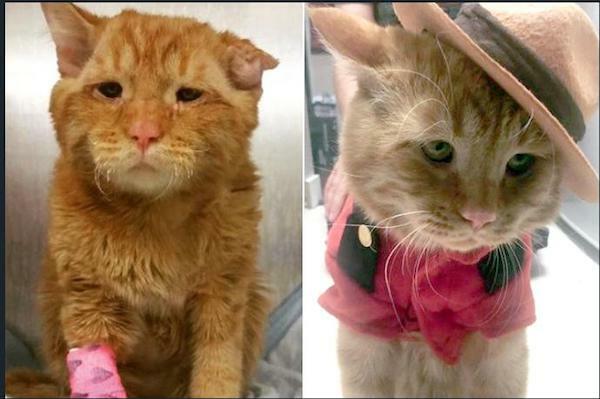 A cat with a heartbreaking story has won the hearts of thousands after pictures of his astonishing transformation were shared online. BenBen, a ginger tabby, was living out his days at an animal rescue shelter. Or, rather, he was simply existing. Staff at the shelter believed he had been attacked by a big animal, according to BoredPanda , as he had "a crushed spine, several deep lacerations and a cauliflower ear." But his permanent sad face is his most endearing quality. BenBen was scheduled to be euthanised and workers at the shelter said it was as if he knew - he had stopped eating, drinking or even moving. Luckily, a kind-hearted woman decided to take BenBen in, despite the fact he was very poorly and on pain medication. “We managed to get everything sorted out the day before his scheduled euthanization and brought him to his forever home, ” she told LoveMeow. “He was instantly full of purrs, smiles, and ‘thank you’ cuddles, ” his owner said. On his Instagram account, there are photographs of BenBen settling into his new home - and he looks incredibly happy. Who could turn away this lovable pooch? 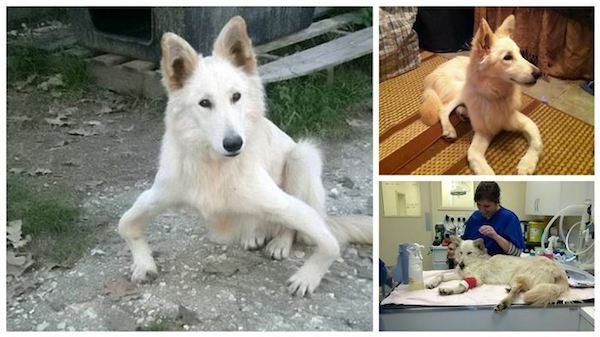 Sandy, a severely bowlegged pup nicknamed “the wonky dog” by British press, was abandoned in Greece. After learning about the animal, however, United Kingdom charity Mutts in Distress helped raise the money to drive Sandy to the U.K. for life-changing surgery. Pat Clark, of Mutts in Distress, said she first found out about Sandy, who also has difficulty seeing, through her contacts at an animal sanctuary in Corfu, Greece. Clark called for donations through the Mutts in Distress website, and animal lovers responded generously, donating hundreds of pounds for the dog’s transportation and keep. Sandy arrived in the U.K. in December and successfully underwent surgery last week to repair one of his legs. Chaim Pilsof, a veterinary surgeon at Companion Care vets in Cambridge, England, offered to perform the surgery free of charge, Yahoo! News reports. Plates were inserted in one of the dog’s deformed legs, but Sandy will need months of physiotherapy as well as a consult with an eye specialist. Still, Clark said that Sandy has been given a new lease on life. 10-week-old Casper was in a bad situation in a "backwater area of Kentucky" when PetPromise Inc. arranged to pick him up. 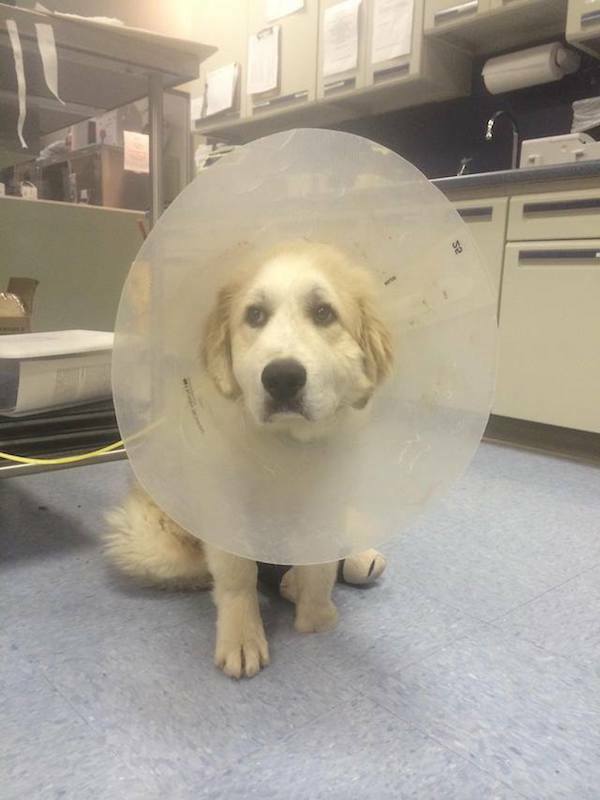 The rescue was contacted about the Great Pyrenees puppy and was told "there was something wrong with his foot - he was missing some toes". They arranged a transport and a foster group and soon Casper (and his sister, Rowan) were on their way to help but they immediately had to be rushed to the vet. The rescue added: "While there, we had them do x-rays of Casper's foot to see what the issue was. What they found was quite a shock. 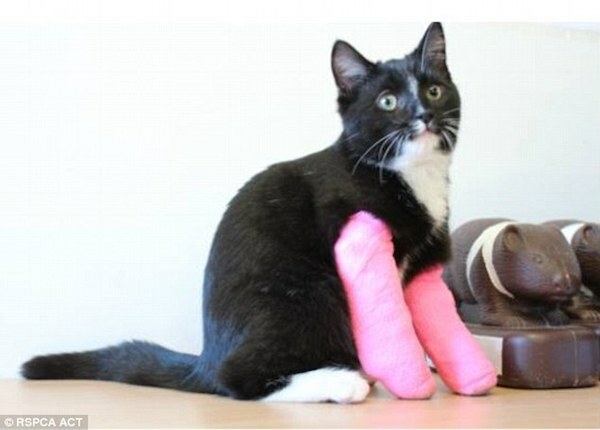 He was born with a deformed paw, his toes were completely deformed, and he had stress fractures in his leg from not being able to properly balance himself." Casper’s options were to either have his leg amputated (which for a dog that will grow to around 120 pounds is not ideal) or do surgery on his foot to remove the toes and fit him with a prosthetic foot. 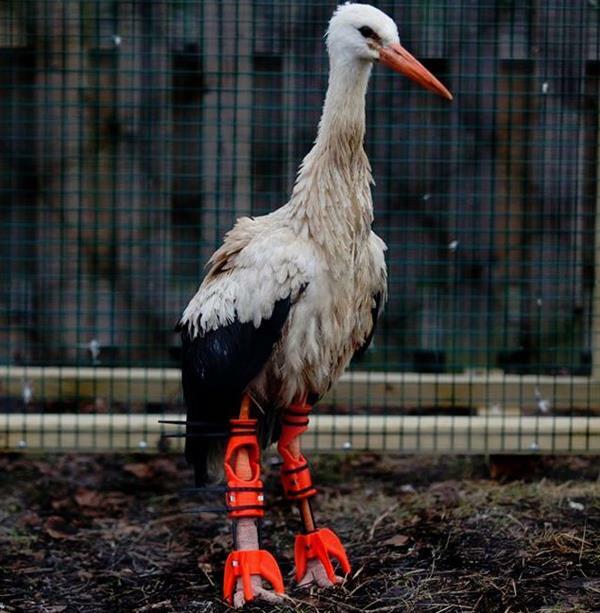 Although prosthetics is the longer and more costly option, it gives him the best chances for a long and happy life so that option was the one selected by the rescue. Rowan has since been adopted by one of the staff members at Rascal Animal Hospital. As for Casper? "Casper is now tick-free and enjoying time in his foster home, PetPromise writes: "He LOVES other dogs, his foster kitty siblings, and all the people he gets to meet. Because he and his sister were born and left outdoors where they came from they were very shy initially. In the month he has been with us he has completely blossomed and come out of his shell completely! He is loving, sweet, and just a gorgeous, giant happy boy!" 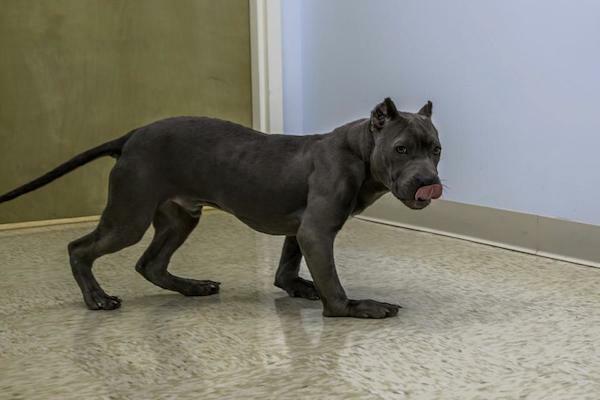 This dog was called Gargoyle because his body is deformed from being forced to grow up in a cage that was too small for him. But he’s now got a second chance and a new name – Landis. The young Pit bull was rescued by Second Chance Rescue NYC Dogs after they received a plea from a shelter. “With all the horror stories we have seen and shared this year, words like “heartbreaking” don’t seem to mean much anymore. It’s really sad, as we shouldn’t have to use them so often. “That said, there really is no better word to describe “Gargoyle” who we received a plea on from a GA shelter last night. This sweetheart of a boy is said to be 1-2 years old and as you can see, he is dwarfed. He is emaciated, his legs are basically, folded in half and his spine is curved. To look at him, you would guess he’d been forced to grow up in & live in a small cage. Well, guess what, you’d be right!! Where do these monsters come from that walk among us?! “After feeling heartbroken, the next normal response is anger. How could anyone do this, how could this possibly have been allowed to happen?! And, it makes one feel even worse because this boy is a complete mush. You’d think he’d be angry and frustrated and difficult, but he’s not. Like most abused dogs we meet, he just wants to give and receive love. Landis will have a long recovery ahead, but he is surrounded by love and care. He visited an orthopedic specialist who noted that Landis’ legs have improved already from the time he was rescued and the doctor believes his legs will continue to improve. The specialist’s recommendation was to not proceed with surgery at this time because the surgery is very painful, and Landis is regaining muscle tone in his legs on his own. “His legs will never be perfect, but Landis is happy and not in pain and that is what is most important,” wrote Second Chance Rescue NYC Dogs. Instead, Landis needs a home where he will not be forced to walk on concrete or hard surfaces, which has a backyard with lots of soft grass. And Landis has found that perfect home! The beginning of Noah’s story was almost the end. The dog was found at five months old, struggling to survive in the dirt at a backyard breeder in California. Born without eyes and deformed back legs, the tiny, white Bichon poodle mix had no chance to snap up any of the kibble scraps thrown in the filthy space he shared with his two siblings. Emaciated, frightened and just two pounds — that’s how the rescue Saving K9 Lives found him. Lisa Marie saw a picture of Noah in this condition on the Facebook page Everything Rosy, and she didn’t see a dog beyond help; she saw a dog she needed in her life. “It was a visceral response of ‘I need that dog.’ It didn’t take but five minutes before I started an application,” the nurse and kindergarten teacher told PEOPLE. Already the mom to one blind dog, Lisa Marie had been looking to help another visually-impaired pup for the past year, but hadn’t found success yet. Living in Wisconsin, she wasn’t expecting much when she submitted the application for California-based Noah, but just a few days after seeing the needy dog’s photo, Lisa Marie received a call that became the start of her life with this inspiring canine. After extensively vetting Lisa Marie and helping Noah recover, Saving K9 Lives sent Noah to his new forever home in Wisconsin, equipped with a donated wheelchair and custom Muffin’s Halo to help him navigate his now-promising life ahead. It didn’t take long for Lisa Marie to find out her new pup wasn’t just a survivor, but a special soul as well. After seeing the soothing effect this cuddle-wielding dog had on friends and family, Lisa Marie decided to share Noah’s tenderness with the world by bringing him to local nursing homes. The positive power of his presence was immediate and astounding. Residents who spent their days in resigned solitude melted under the weight of this now-12 lb. dog. “The first time we went to a nursing home I didn’t know what to expect. This little old woman, who was in the dementia unit, hadn’t spoken for so long, and when Noah got into her lap she started to grunt. It was at that point that I knew that he had something,” Lisa Marie recalled in awe. Noah didn’t have to go sniffing around for his next opportunity, it found him. Shortly after starting their nursing home visits, Lisa Marie and Noah received a call from a local school looking for help with a bullying problem. Lisa Marie knew Noah was the answer. She arrived at the school with Noah in all his gear. While the schoolchildren looked at Noah — no eyes, a wheelchair strapped to his legs and a halo fixed to his head — Lisa Marie asked the kids what they thought Noah couldn’t do. Jump, run, play were many of responses. “And I will say ‘Yes he can.’ And they just go ‘Wow! but he looks so different,’” Lisa Marie said. And it is precisely this message that she and Noah are looking to get across: Someone who looks different from the outside, is just the same as everyone else. Differences shouldn’t exclude anyone, or making them feel less than; instead we should approach everyone from a place of acceptance and empathy. “By the time we leave they don’t see Noah as a disabled dog. That’s how I want humans to see each other,” she added. Noah’s message and signature heart-to-heart hugs have become so popular with schools that the pup earned a place in Murray Park Elementary School’s yearbook, as the 5th grade’s Honorary Favorite Rockstar. 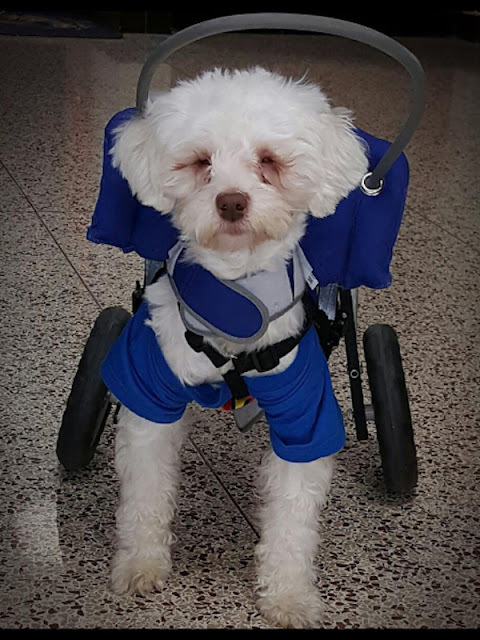 This little dog’s big influence isn’t just felt locally, Lisa Marie can easily recount messages she has received from all over the country from those positively changed by Noah’s story of strength and compassion. She has received notes from a woman undergoing chemo, who brings a picture of Noah to her sessions as a reminder to be strong and others from a proud mother of a child who decided to stick up for a little girl being bullied after he found Noah on Facebook. “It’s these stories, that you think people may not be listening or they are not taking it to heart, but then you get stories like this and it takes your breath away. 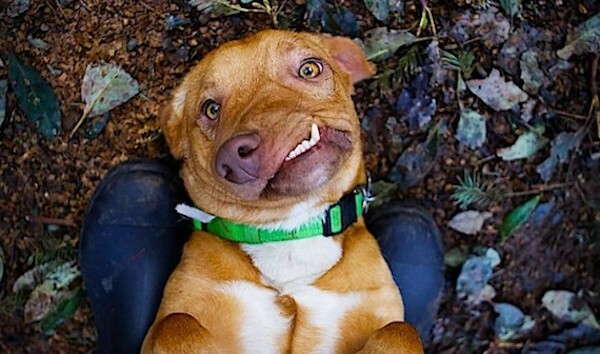 Here is this dog, who shouldn’t even be here and he is saving lives,” Lisa Marie said. Noah’s message is spreading fast, and it is about to go fully national. The pooch is currently a semi finalist for Emerging Hero Dog Award at the American Humane Associations Hero Dog Awards. Starting in an applicant pool with hundreds of other dogs, Noah’s healing work and dedication to doing good has earned him a spot in the final three for his category. Lisa Marie decided to enter Noah (who you can vote for once a day until June 22) into the awards in memory of a special poodle named Muffin. It is because of this furry soul that Noah can travel through the world without fear. When Muffin, Silvie Bordeaux’s beloved poodle went blind, the dog lover changed the course of her life and dedicated herself to finding a way to make Muffin’s life easier. She came up with Muffin’s Halo, a device for visually-impaired dogs that prevents them from bumping into walls, allowing them to learn new spaces and reclaim their independence. Bordeaux has provided Noah with halos throughout his life, and helps hundreds of other blind dogs through her non-profit Second Chances for Blind Dogs, which provides halos to owners of blind dogs for free, so they do not have to surrender their pet due to medical expenses. Noah and Lisa Marie hope to build on this legacy with a win at the Hero Dog Awards, but more than anything, the pair want to create hope and happiness for the countless people out there who feel that they are different and are bullied because of it. “If we can stop one kid from being bullied to the point of suicide, Noah has done his job,” Lisa Marie shared. To accomplish this, Noah plans to keep visiting schools and spreading his message of acceptance and empathy at events and online. He has even gone so far as to open his own bank account, that way any donations he receives can go directly into his paws and be used to help dogs in desperate need of help, just like he once was. Noah has found his safe and loving forever place, now he is doing everything a pup can do to make sure others find their happy place too. They said she had no chance but then a miracle happened… She fought back! A tiny kitten lived alone and neglected on the streets of Istanbul, sleeping in a garbage can. Istanbul has 14 million inhabitants. Out of those millions of people, not one person paid her any attention. No one stopped to help. But then, one day, a seven-year-old girl heard the kitten’s cries among the trash and rushed over. It was written in the stars; her father is a doctor. Together, they decided to nurse the kitten back to health and give her the home she’d always dreamed of. These days, Gülümser and her human hero are inseparable. And, as you’ll see below, the kitten is recovering in the most stunning way. Her wounds are healing. Her fur is growing back. 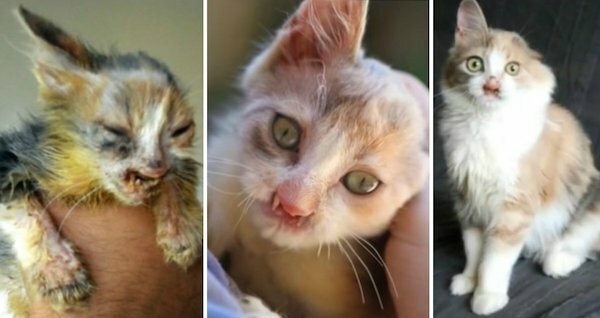 She’s transformed into an adorable, fluffy miracle with a face that tells her story of courage and hope. 0 Response to "10 Second Chance For Animals Disabilities"